Just about the time I begin to think I have seen it all in Vacation Rentals something new comes along. There are major mansion size log villas and cozy little wilderness cabins. But located some eight miles west of town is the only known rolling vacation rentals. 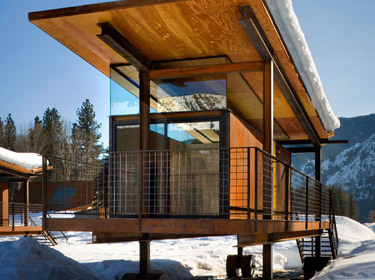 Rolling Huts (www.RollingHuts.com) were designed as a modern alternative to camping by Tom Kundig of Olson Sundberg Kundig Allen Architects in Seattle. Grouped together as a herd, each of the huts has a view of the mountains and is built upon a group of wheels, albeit ones that don't roll very easily. 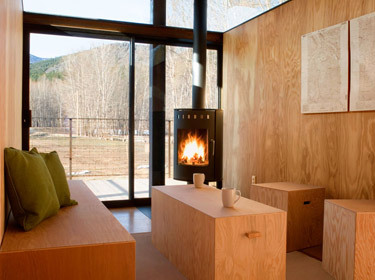 Each unit comes equipped with a small refrigerator, microwave, fireplace and Wi-Fi. A sleeping platform is perfect for two, and the modular furniture in the living area can be reconfigured to sleep two more. There is a water faucet outside each hut. Propane barbecues are shared and each unit is equipped with kitchen utensils. Each hut has an adjacent portable toilet, and full bathrooms and showers are housed in the centrally located barn a short distance away. The idea for the huts came about because the 44 acre site had zoning restrictions that only allowed for RV hookups. They are markedly low impact and low design. The huts cost about $75,000 each to build. The huts rent for $125 per night, a bit higher during holidays. Pets are welcome for a fee. There is a restaurant on the site where guests can grab their meals, but many will drive the short distance into Winthrop or further down the Methow Valley to find Western grub and hooch. Also on site, guests enjoy a picnic area, common room, outdoor volley ball, public restrooms and showers. 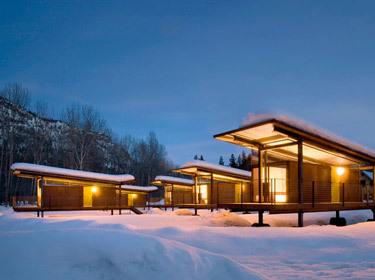 The resort is ideally situated to access the Methow nordic ski and summer sport trails. The area is famous for majestic mountains, pristine rivers, hot summers and frigid winters.